I previously wrote about the history and beginnings of the vegetarian festival in Thailand, but for this article I'll be focusing more on the experience, the sights and tastes. Last year, while living in Bangkok, I somehow persuaded myself to eat a strict vegetarian diet for the entire nine-day festival. This year, I didn't make that commitment as I simply had too many things going on, but I was still able to take advantage of a few vegetarian meals and activities that revolved around the festival. The annual event, which happens to be one of the most anticipated festivals in the county, took place this year from October 15th to the 23rd. For nine days straight, plus a few days on either end, Bangkok was a frenzy of street hawkers and restaurants scrambling to prepare pure vegetarian food to cater to probably 50% of the population that attempted to switch from a pork diet to a veggie filled diet. Some accomplished the task for the full nine days while others slacked a bit and made it through just three days or even one. With roots in Chinese Doaist beliefs, Bangkok's Chinatown is the epicenter of the events in the city. One day during the festival I headed down to Chinatown to see what I could discover. In order to get into the local temples and also to fit in more to the festival, it's mandatory to dress in all white from head to toe. This mainly signifies purity, a fresh beginning, and an overall cleanse of the body. 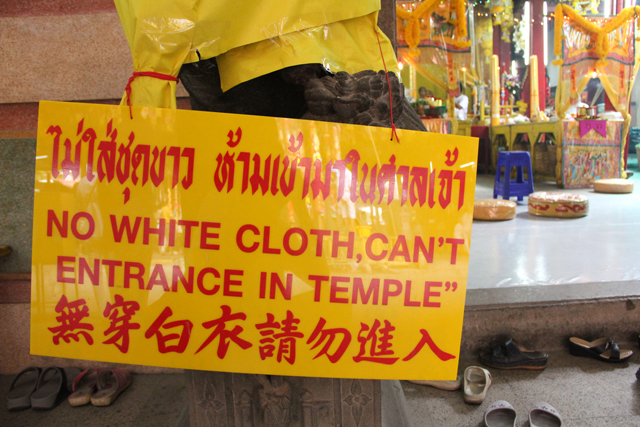 Luckily, I had borrowed some white clothes from my girlfriend so I had access to the main temples. Fan Jao Jo Sur Kong Chinese temple is where many of the rituals take place during the festival in Bangkok. The area is kind of like an outdoor open air gym. There's an indoor shrine section on one side of the temple and the Chao Phraya River on the opposite side. 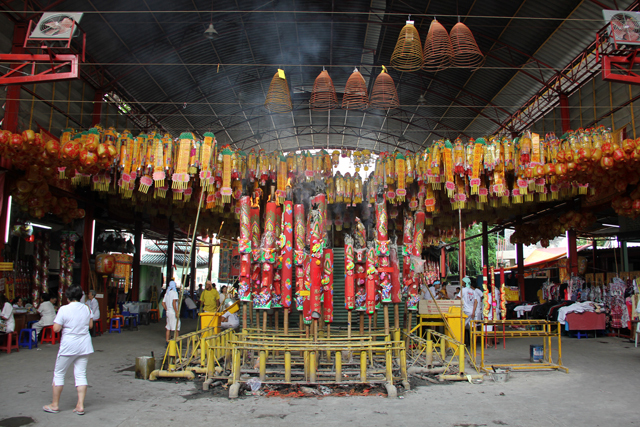 One of the main religious practices for Thai Chinese during the festival is to purchase either a huge candle, a massive incense torch, or a lantern – all of which will eventually be burned. As soon as someone purchased an item, the crew of staff would quickly erect the torch or candle into an upright position, and then light it on fire to burn until fully turning to ash. Likewise, if the commissioner chose a lantern, the staff would proceed to hang it high on a rafter of the roof to be burned at a later point. Observing the clouds of smoke rising to the roof from the smoldering cluster of incense torches and candles was a very interesting sight. The highlight for myself, was of course, was the fabulous selection of vegetarian Thai food and snacks that surrounded the temple and which were available around the entire city. When I arrived to Chinatown I was hungry, and after a little exploration I discovered a restaurant tucked into the back streets that was serving a mind-blowing selection of pure vegetarian food. As a side note, during the festival all vegetarian food is marked by yellow flags and streamers, indicating that it is meatless. It was a tough choice to choose which dishes I wanted to devour, but eventually I settled upon some stewed tofu and bean curd, a piece of tender cabbage, and a plate of fried yellow noodles. Though all vegetarian, I'd have to say I was pleasantly surprised at how good it all tasted. Just outside the gates of the temple was a famous stall serving deep-fried dumplings. The wrappers were not crusty old ordinary casings, they were intensely crunchy on the outside and gooey on the inside-outer layer. Packed with a combination of cabbage, carrots, and mushrooms, they were delicious. It's pretty interesting to watch them make this candy! 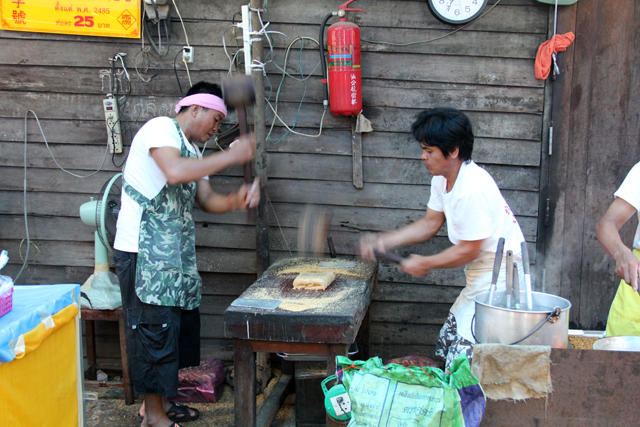 Another one of my favorite snacks during the festival was Khanom Dub Dab, a hand pounded sweet peanut brittle candy. Two guys, each armed with a wooden hammer, alternated taking hits until the peanuts were fully crushed into the sugary candy (you can see the pounding process in this video – it's really cool). The candy is extremely sweet, tastes very similar to a Butterfinger candy bar, and I think it goes particularly well with a cup of black coffee (though I cheated, because coffee is actually not permitted if you are really participating in the cleanse). Though I was only able to participate in the Thai vegetarian festival for a single day in 2012, I had an enjoyable time observing the festivities in the temple and tasting some delicious snacks. 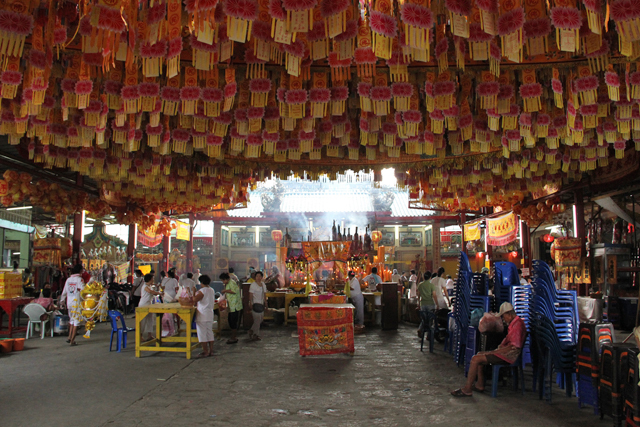 The vegetarian festival in Thailand takes places annually in either September or October. Hi Mark – Thanks for this post. I have wanted to check out the vegetarian festival but haven’t been able to make it to Thailand at the right time of year! 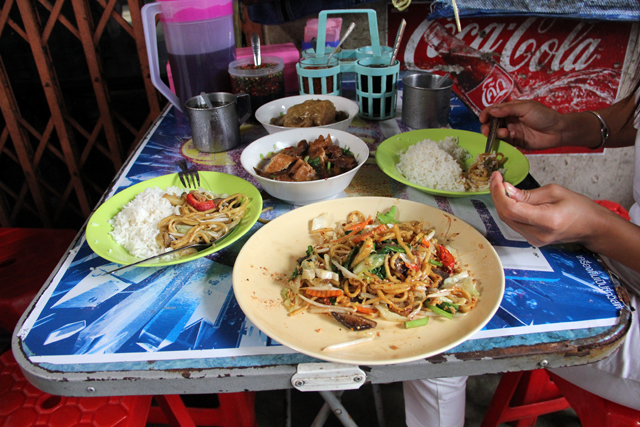 One of my favorite travel moments ever was sitting on a traffic median in Bankgok while scarfing down a 50 cent portion of Pad Thai. For more tasty travel moments, check out craftyourtravelstory.com/what-is-the-tastiest-trip-you-have-ever-been-on.